While in port at Honolulu (Jan 12) I diverted my Biodiversity and Conservation class from Waikiki Beach and took them on a field trip instead. The group included 23 students and Karina Holden, Australian director of the ocean conservation film Blue. Our first stop was at the Fish & Wildlife Service offices in Honolulu where they gave us a presentation on the linkages among wildlife trafficking, human trafficking, and corruption. I had seen much of the FWS footage but some students were shaken by the photos of wildlife poaching (see Racing Extinction and Virunga for examples), ultimately a symptom of widespread poverty. Three of the agents that hosted us (on furlough, by the way, and a Saturday) work undercover, infiltrating smuggling networks to shut them down as close to the top as they can. It’s not as dangerous as it sounds, although for one case they infiltrated the Russian mafia to disable the caviar market. This office is also a small repository of evidence so the students handled contraband such as narwhal and elephant tusks, pangolin scales, baleen, and a cloud leopard pelt. A three-mile hike along the north shore gave us a chance to process the exploitation issues that we saw at the FWS. 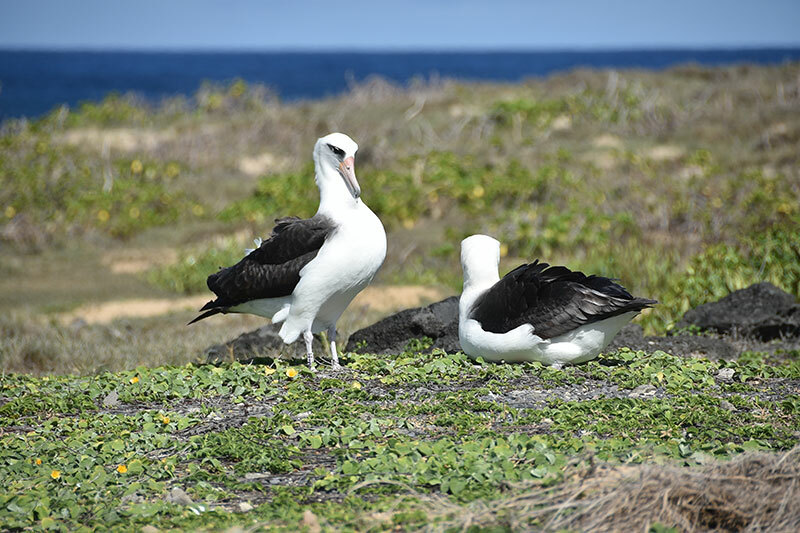 We hiked to the northwestern tip of the island, Ka’ena Point, where Laysan albatross (Phoebastria immutabilis) and wedge-tailed shearwater (Ardenna pacifica) are re-establishing in a once ravaged, now restored coastal habitat. 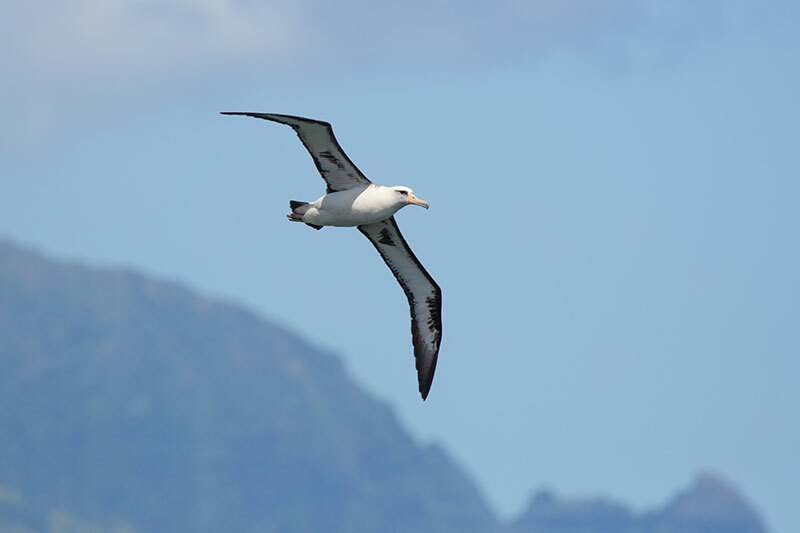 Albatross did not evolve with predators so have no natural defenses, behavioral or otherwise. Introduced pests such as rats, mice, mongoose, cats, and dogs can walk right up to an albatross and kill it – or consume part of it – with no resistance. About 10 years ago FWS funded a massive restoration and predator eradication effort at Ka’ena Point Natural Area Reserve including a fence 2m high/1m buried and various unpleasant means of removing predators from the ~200-acre area. Pacific Rim Conservation (our hosts) and The Wildlife Society-Hawai’i Chapter partnered with FWS for the first phase that included these efforts along with significant permitting and outreach, the latter to address intrusion of the project into a spiritually significant area. 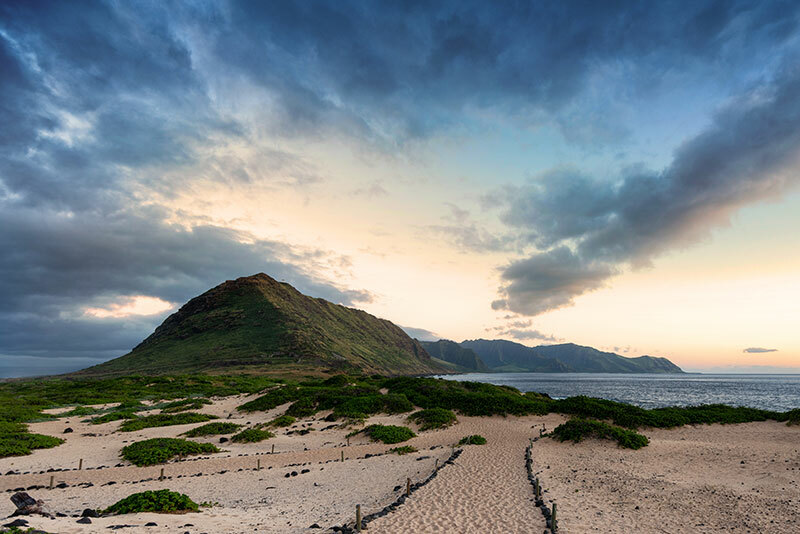 Within the fenced protected area is an oasis of thriving Laysan albatross against the dual backdrop of a volcanic ridgeline on one side and frothy aqua-colored breakers on the other. The albatross are ~2.5′ long, have wingspans of ~6′, fly elegantly, and their gray/white faces look airbrushed. They also walk like an old guy with a beer belly, probably named Mitch or Gus, and we couldn’t help but laugh at their exaggerated head-bobbing conversations. Native plant species are also in recovery and starting to dominate once again now that their seeds are safe from rodents. 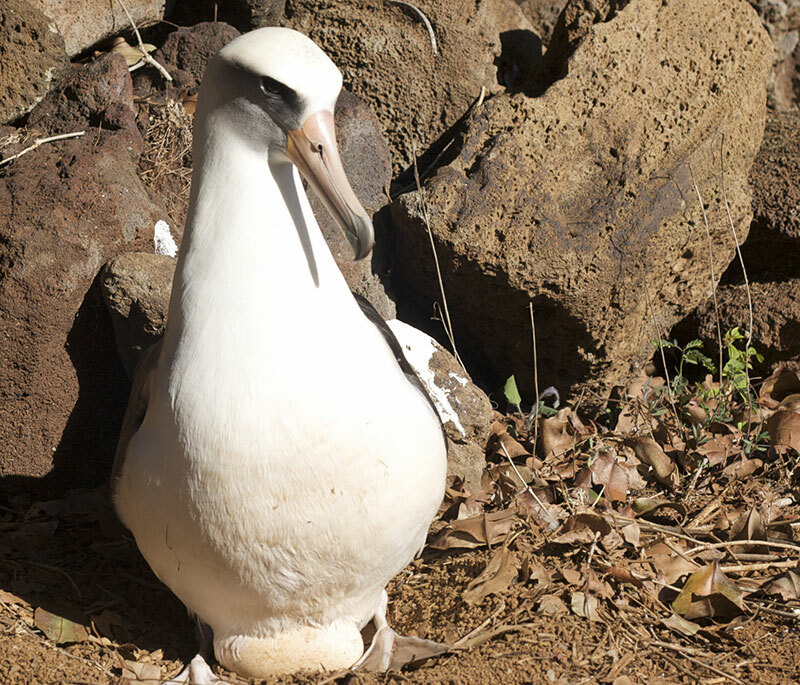 Trail users mostly honor the symbolic fence (2 foot-high wooden posts connected with a rope strand), but indeed you can walk right up to an albatross and pick it up if you want to. Which Lindsay Young (of PRC) did: she brought an unbanded bird to where we stood on the trail and passed it to a student. About twice a day when she’s on-site Lindsay bands a bird, takes a blood sample, and plucks feathers for an N/P signature. The student’s arms were completely filled – he said later that he could feel its heart beating, and felt a parental ambivalence about upsetting the bird for the sake of its species. Occasionally an albatross will abandon an egg (size of a big Russet potato), one of which was in a nest built right on the trail. PRC protected the nest with temporary staking and monitored the egg by candling. One by one, Lindsay wrapped each of us in a black sleeve the size of a beach towel to block the sunlight, held a flashlight up to the egg, and we could see vascularization and movement of the embryo. Every single student emerged from the candling demo with a smile on their face, some crying. The egg died in a few days, but the parents returned to incubate it. Lindsay had three eggs at home in her incubator so switched a live egg for the dead one about a week after we were there. …Back on the ship: At our next class meeting I asked for short essays on what resonated most for the students on our field trip to Ka’ena Point. Some students are ready to change majors in order to pursue a conservation career. A few want to work undercover for wildlife. Some couldn’t understand their emotions. While all of us were awed by the land- and seascapes, some of us were silenced by the little egg. This conservation story at Ka’ena Point has new voices.